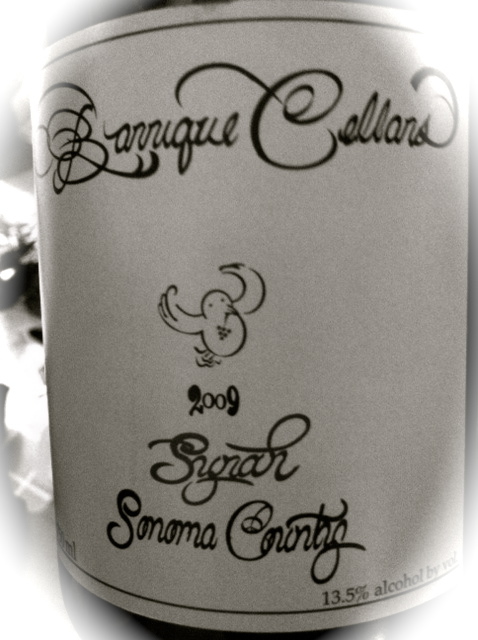 Whatever worries you have in this world, you will forget them with the first taste of this wine, Barrique Cellar’s 2009 Syrah from Sonoma County. But if I were to remember those worries, it would be about my tendencies as of late to buy French wine, but this bottle (and yes, foreshadowing to the final review, it was the entire bottle) made me believe in America again and all that is good. This wine was also comfortable and familiar. The body, tannin, flavor and lingering notes invited me into a leather-book lined library at dusk where a soft wool rug awaited me before an unlit fireplace as Van Morrison melted a ballad out of the nearby speaker. I am lucky, this bottle was a gift (I have great friends), but the little bird on the bottle told me it was from Schneiders in DC on Capitol Hill. I didn’t know it at the time, but I skipped straight to the workout to drink the bottle, and have no regrets.